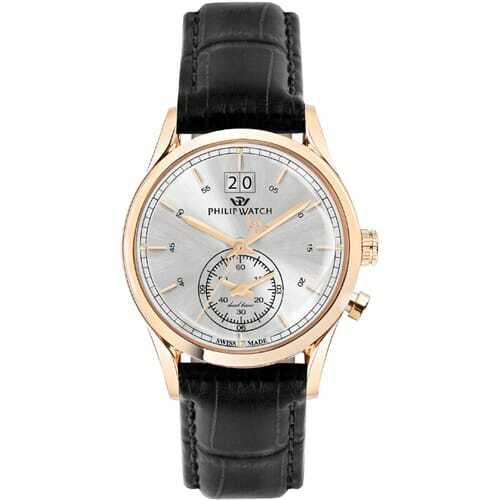 Ideal for an elegant and cosmopolitan man, this is the man’s watch from the Sunray collection. Elegance and the unique Philip Watch style are declined in a vintage key, with reference to a retro appearance, making this dual time model even more refined. The black leather strap with alligator print embraces a 39mm case with beautiful pink gold finishes. The same sophisticated elegance can be found inside the quadrant. The silver shade of this element is illuminated by pink gold details, such as the hands and indexes. The lower part of the quadrant holds a small counter. This watch is, in fact, equipped with dual time, a mechanism that also shows a second time zone: a very useful function for those who travel often, perhaps for business and always in the same city and need to know the time of two different places simultaneously. A characteristic that integrates perfectly inside the quadrant and does not change the elegant and refined appearance of this precision jewel. Rounded glass, a detail inspired by a retro touch, protects everything, the perfect final touch for a time keeper with this style. The result of the perfect combination of two important traditions: Swiss technique and Italian beauty. The Philip Watch mechanisms are, in fact, Swiss Made, a characteristic that guarantees precision and reliability! This level of technical perfection is combined with design work with its roots in Italy, where beauty is not only an adjective but a lifestyle. Italian design always creates new solutions, a sign of elegance and refinement, for those who love to revel their style in every possible detail. An apparently impossible mission that comes true with this man’s watch from the Sunray collection, scanning every second with unique style.